Examining and understanding the link between organizational culture and the employee experience. 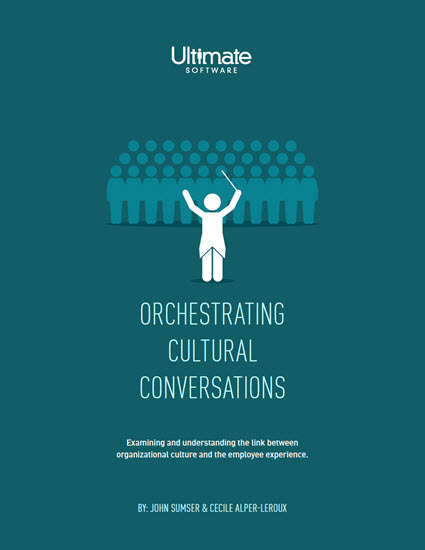 John Sumser and Cecile Alper-Leroux provide an in-depth look on how to orchestrate real cultural change within your organization. Do you know what exactly organizational culture is? Do you know the defining attributes of an organizational culture? More importantly, do you know what actions can improve your culture, or how these actions affect the employee experience? John Sumser, principal analyst at HR Examiner, and Cecile Alper-Leroux, VP of Human Capital Management (HCM) Innovation at Ultimate Software, seek to answer these questions by providing you with a framework for thinking about culture and the actions you can implement at your organization today. In this whitepaper John and Cecile examine the link between organizational culture and the employee experience, and how to put it all together to effect real change in your workforce. Please fill out this brief form to learn the link between culture and the employee experience.